One Botanical is NOT just another Gin … it’s not a Gin at all. As the garden-to-table revolution began in northern California, Allison Evanow saw the need for craft cocktail ingredients that got back to fresh basics — back to square one. So she founded Square One Spirits in 2006 to develop organic spirits with a quality to satisfy even the most demanding chefs. Let’s call it “garden-to-bar” spirits. She started with Vodka based on 100% American Rye grain and developed a custom organic fermentation process to ensure no compromises. Building on this foundation, she has slowly and deliberately expanded her product line to four more tasty infused products. They call Square One Botanical “Eden in a bottle.” That does a pretty good job of describing the fresh, clean, and delicate nature of the spirit. It starts with a 90-proof version of their Rye Vodka base infused with eight botanicals: pear, rose, chamomile, lemon verbena, lavender, rosemary, coriander, and citrus peel. You might notice that there are a lot of ingredients in common with Gin, and that’s a great way to think of it — as a fruit-forward Gin that leans toward lightly sweet florals and kicks the juniper to the curb without losing the natural kick of the Rye. Square One caught the attention of media mogul Oprah Winfrey who named the entire collection of their organic spirits as one of “Oprah’s Favorite Things” for 2015. 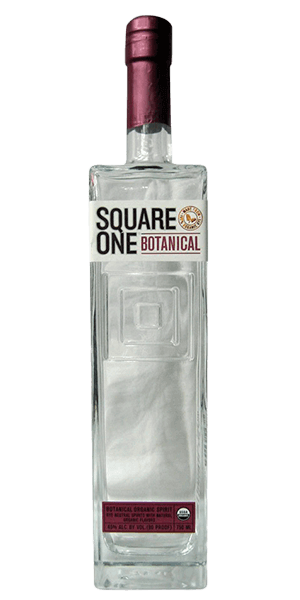 What does Square One Botanical Vodka taste like? The Flavor Spiral™ shows the most common flavors that you'll taste in Square One Botanical Vodka and gives you a chance to have a taste of it before actually tasting it. I like the description. I cannot drink gin due to the juniper berries infused in many brands of gin. I note that this vodka does not include juniper; is this correct?